The PBB Kragujevac Wild Boars had a terrific start not only to the season, but also in the first 20 minutes of the game. They won 28-55 in Budapest, where the game was semi-decided after a little more than a quarter. Following a 20 point first quarter, Stan Bedwell passed for the fourth of his six touchdowns that gave his team a 27 point lead. It was 7-41 at the half. The Wolves recovered a bit in the second half even outscoring their opponent, but it was really too late. Bedwell hooked up with Milorad Živković for the first touchdown and then four times in a row with Chad Rusinkovich, all in the first half. The Wolves managed just one score when Péter Lenner ran in for the touchdown. Bedwell connected with Henry McVay early in the third quarter that gave the Boars their biggest lead of the game: 7-48. 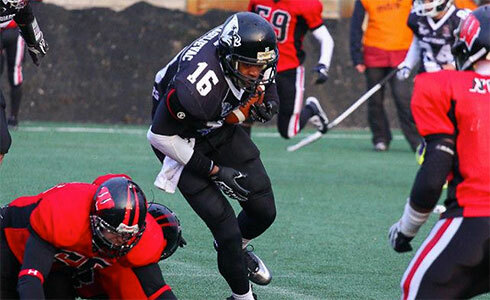 The Wolves responded with three touchdowns, two more from Lenner and one from Dávid Récsey. The winning team still finished the way they started – Milorad Živković caught the first and last touchdown, this time from backup quarterback Stefan Stefanović.